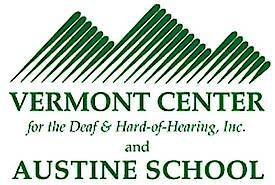 The mission of The Vermont Center for the Deaf & Hard of Hearing, Inc./ Austine School for the Deaf is to provide comprehensive educational and support services to Deaf and Hard of Hearing children, adults, and families throughout Vermont and surrounding states. Develop broad-based literacy (linguistic, quantitative and cultural) as well as, critical thinking, problem solving and decision-making skills. Develop a positive sense of self worth and independence. Respect and reflect both the language and culture of the American Deaf community, English as the language of society at large, and the linguistic and cultural diversity of students and their families. The Austine School for the Deaf opened its doors to deaf students in 1912 when Holton Hall was completed. For the next 40 years Austine was a single building until the Croker School building was constructed in 1952. Austine always served Vermont students but beginning in the early 1960’s students from New Hampshire and Massachusetts have attended the Austine School. In the summer of 2006 Austine was visited by the Department of Education of New York and is now approved to serve New York students. Austine is a K-12 program with a full range of support services and extracurricular activities for all ages. The Elementary School serves students of preschool age though fifth grade. It provides a comprehensive developmentally appropriate and academically focused educational program. Incorporating the SPICE philosophy, which encompasses the social, physical, intellectual, communicative and emotional aspects of development. The program focuses on the whole child. The Elementary School promotes maximum progress for each student through the use of many Montessori methods and materials, the State of Vermont Framework of Standards and Learning Opportunities and the Windham Southeast Supervisory Union (WSESU) curriculum framework. This multi-faceted approach results in a child-centered educational environment in which each child is encouraged to explore and discover the art of both independent and collaborative learning. The goal of the elementary school program is to develop within students a foundation of knowledge, communication proficiency, critical thinking and conflict resolution skills and the level of maturity necessary for a successful transition into the Middle School and beyond. The Middle and High School years are educationally characterized by the provision of comprehensive programming designed to serve students in the sixth through twelfth grades. While continuing to focus upon the whole student, with high expectations and adherence to curricula based upon the Vermont Framework of Standards and Learning Opportunities, the Middle and High School programs provide classes the following core academic content areas: English, Reading (Literature), Mathematics, Science, Social Studies, Art, Health, Keyboarding and Physical Education. A number of electives are provided throughout these years as well. Separate student council forums for middle school and high school students address issues of interest and concern of the two different groups of students. These student councils plan events and activities for the respective groups while they learn how to participate in decision making, brainstorming and planning processes. They also learn about the parliamentary procedures, the art of compromise and the benefits of working as a team. Austine also provides specialized instruction for both elementary and high school students with multiple disabilities and/or special learning needs. These classes generally offer a lower staff-to-student ratio and focus upon the development of functional independent living skills. Instruction is based upon the Syracuse Community-Based Curriculum which meets the Vermont Framework of Standards and Learning Opportunities. Upper elementary students are given pre-vocational education in a variety of activities and instructional milieu. The High school program includes a work-study component in order to prepare students for life after graduation. The Austine School for the Deaf strives to prepare students for entry to college and careers by making learning relevant to everyday life. As mentioned above, classes and activities address the Vermont Frameworks of Standards and Learning Opportunities. Personal Development Standards are the focus of career and technology education. Opportunities for learning occur through a Career Exploration class, a Business Education class, work-based learning, technical education and support services, vocational assessments and transition planning. The Career Exploration class teaches high school students about different careers and workplaces, appropriate work attitudes and behaviors, interviewing skills, job application processes, self-assessment related to future career options and career portfolio development. The Business Education class provides core knowledge and facilitates the development of basic skills necessary to successfully work in entry-level positions in business and office environments. Austine offers work-based learning opportunities to students through the Work-Study Program, which includes on-and off-campus work placements for students as specified on Individual Education Plans. Job coaching and interpreter services are provided as supports to students in the employment setting. High school students can apply to the Southeastern Vermont Career Education Center (SVCEC) for technical education courses that promote the development of specific employment skills. Austine assists students with the process of applying for admission into the SVCEC, provides interpreter services to make the courses accessible and offers tutoring related to the course work as needed. The SVCEC offers courses in approximately 16 different fields, including: Performing Arts, Architectural Design/Drafting, Hospitality, Electronics and Fiber Optic Technology, Construction Trades, Natural Resources / Conservation / Outdoor Recreation, Horticulture, Business Academy, Early Childhood Education and Medical/Human Resources. Vocational assessments are provided to assist students in choosing classes and identifying career interests while they are still in high school. Starting this September, the Austine High School academic program will be housed at Brattleboro Union High School (BUHS). ILS students will remain on the Austine campus. Our high school students and our Teachers of the Deaf will use classroom space at BUHS. Our teachers will teach the Core (English, Math, Science, Social Studies) classes exactly as they do now. Students will mainstream as appropriate, the way they do now. The benefit for Austine students is that they will have access to the state of the art library, computer labs, science labs and other resources that we cannot provide on the Austine campus. Our students will start their day each morning on the Austine Campus. They will be transported to BUHS by our staff. They will return to the Austine campus at 2:20 pm and finish their day (till 3:30) here, with elective courses (Deaf Studies, Yearbook…). Austine will maintain it’s identity as separate from BUHS. We will still have our own sports teams and after school activities. We are not changing our philosophy or our mission. We are striving to offer our students all the tools they need to get the best education possible. This is an exciting opportunity for our students. We look forward to reporting our progress throughout the school year.